Another expansionary move by XO Holdings (news, filings) this morning, as they have opened for business north of the border in Toronto. They've moved into Cologix's data center and meet-me room at 151 Front Street West, and will be offering customers there everything from wavelengths to IP-VPNs. XO didn't have to build far to get there of course. 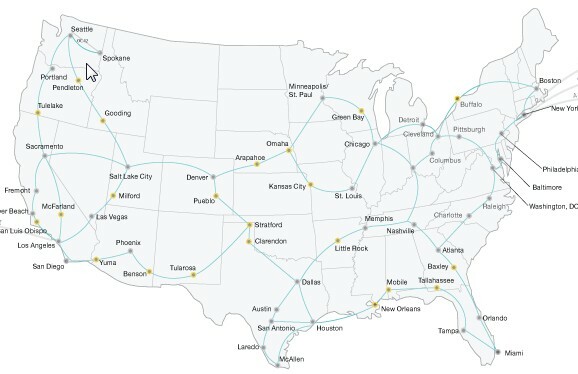 Their fiber backbone derives from the original Level 3 build, which loops up from Buffalo through Toronto and Montreal before heading south to New York City. Like Level 3, however, XO had not taken advantage of its presence to enter Canada's bandwidth market directly due to the country's restrictions on the ownership of telecommunications assets. Those restrictions were partially lifted earlier this year, which has opened the doors for expansions such as this one. 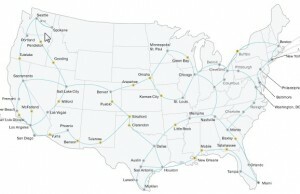 Cologix's facility is the major interconnection point in Toronto, and hence is a logical place for XO to start out there. Cologix has been actively building out more space in the area to handle growing demand for Toronto space and connectivity. It has been just shy of one year since last fall's round of layoffs and internal restructuring at XO. Since summer the company has been making undeniably aggressive moves, casting into doubt the belief that Carl Icahn would push for a quick sale. On the other hand, his initial interest in the assets over at Broadview Networks hasn't amounted to anything, so he's probably not 'all in' - just biding his time while boosting the company's value. But at least now the distraction of the minority shareholder dispute isn't overshadowing the work the company's people are putting in. Sorry, but who cares? Toronto is basically a US city anyhow. Toronto is an important city in NA. Its an area that represents commercial, distribution, financial and economic epicenter in Canada and is the third largest financial center in North America. It is something that should do well for XO. It also closes a major gap that XO has had when compared to larger players such as ATT. And it is very much part of Canada …..
1) some providers use Enwave for cooling, and at least during the ’03 blackout their circulation pumps didn’t have backup power. 2) in ’03 at least one provider didn’t have on-site backup generators; just a contract for a generator truck to come during emergencies.